I’m sad to announce that we lost an important member of our farm family this week. Friday evening I found Donut in the shelter, where he had passed away. Donut, and his half-brother, Sweet Roll, were Christmas presents from my then-fiancée-now-husband in 2007. At that point I had been wanting pet goats for at least a decade, and I was thrilled by their arrival. 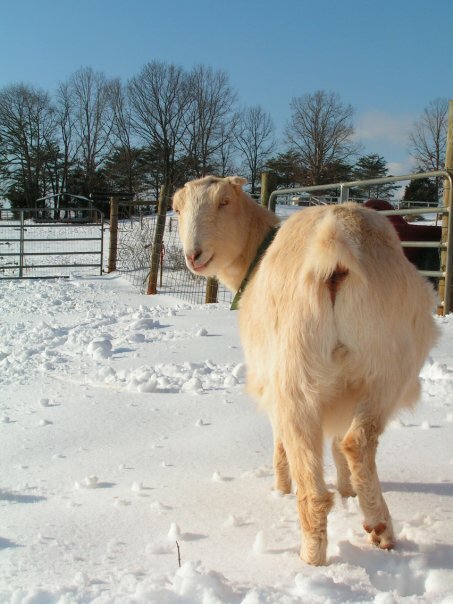 Sweet Roll was instantly a friendly, affectionate goat. Donut, more reserved, took some time before he accepted my friendship. He was a loving, inquisitive fellow. Together, they have supplied an endless supply of shenanigans, laughs, excitement, and yes – on occasion, frustration! – on the farm. Last year, with the addition of our small dairy herd, Sweet Roll and Donut took on the role of the laid-back, fun-loving uncles who looked after everyone. We had figured that Sweet Roll, with his on-going battle with pemphigus and a nasty staph infection, would be the first of our pets to leave the farm. In the spring I asked HB if we could keep one of the new wethers as a companion for Donut. At that point, we were certain Sweet Roll would be put down. But Sweet Roll pulled through, and is looking pretty good. Instead, now it is Sweet Roll who will be comforted by the presence of Bogart and Gatlin (well maybe not so much comforted by the later, our buck!). I miss Donut very much, but it appeared that he left this world peacefully, with no signs of a struggle. For that, I am grateful. On a side note, we will have some exciting news soon! Stay tuned for more information. Sorry to hear about that. How is Gatlin doing? Sorry to hear about Donut. Pets are special people in fur coats. Ziggy – Gatlin is doing very well! I should take some pictures today; he’s growing up and looking very buck-like! Amazing the difference the hormones allow between him and our wethers that are nearly the same age! He is a precious, friendly fellow! Joan – Thank you for your thoughts during your own time of grieving. I was so sorry to hear of your own loss this past week. HB and I are keeping you and your family in our prayers. So glad to hear that Sweet Roll is still with you and doing well. Oh, I’m so sorry. That is just so sad. Were you able to figure out what happened? He looked so healthy it’s hard to believe.